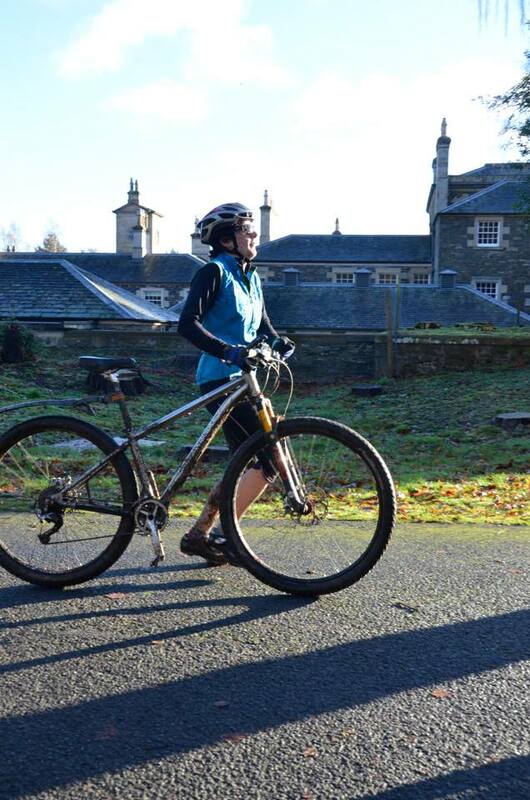 My second last race of the year was back at Bowhill estate near Selkirk. My map says I have done a lot of riding down there recently! It’s quite a long drive for quite a short race, but Andy was coming with us for extra company and there was a really big club turnout. When we got there Andy sprinted off to run round the course whilst Glen and I registered. I started getting psyched out by all the fast looking girls I didn’t recognise milling around. We also said “Hi” to clubmate Jo, who is a very fast girl I do recognise and who won all the series last year! Andy made disapproving noises later about my warm up, which consisted of a spin round near the car to check that everything was working (yes) and that my tyres were inflated enough (no). Soon we lined up, run first. I was apprehensive as my hip is still not fully healed. This would be my first ‘effort’, and at the slight disapproval of my physiotherapist. I had assured him it was short, and it was. Just 19:28 minutes of running up a hill and back down again, and I came into transition 4th girl after swapping places with a girl called Kirsty all the way round, and being overtaken just before the end by another. I could still see them just ahead though and was confident in my biking ability. Jo had long gone. 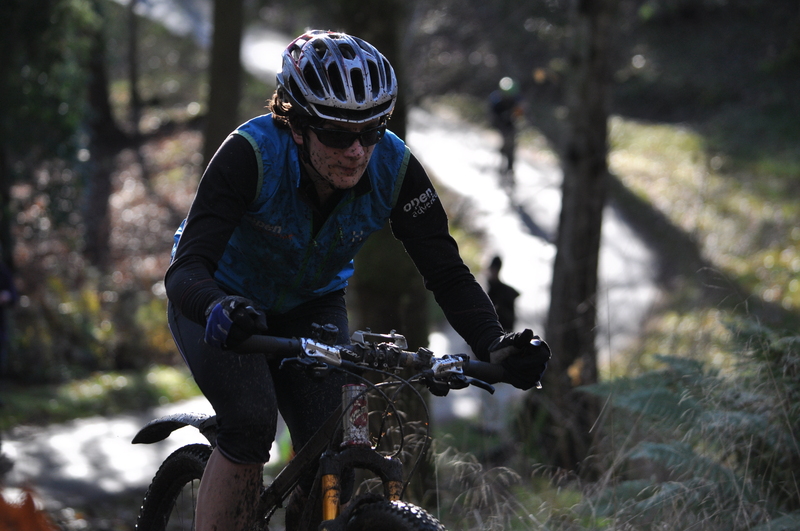 I did a competent enough transition and was soon out on my bike blasting after the others. 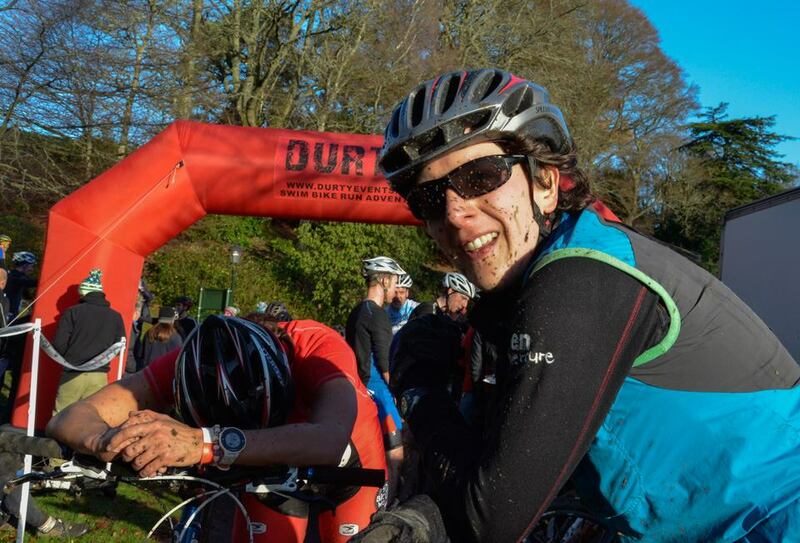 There were a few people to overtake – the fast runners who weren’t such good bikers. I like it this way round for that reason. It’s much more motivating to be catching people up than to be running in fear! 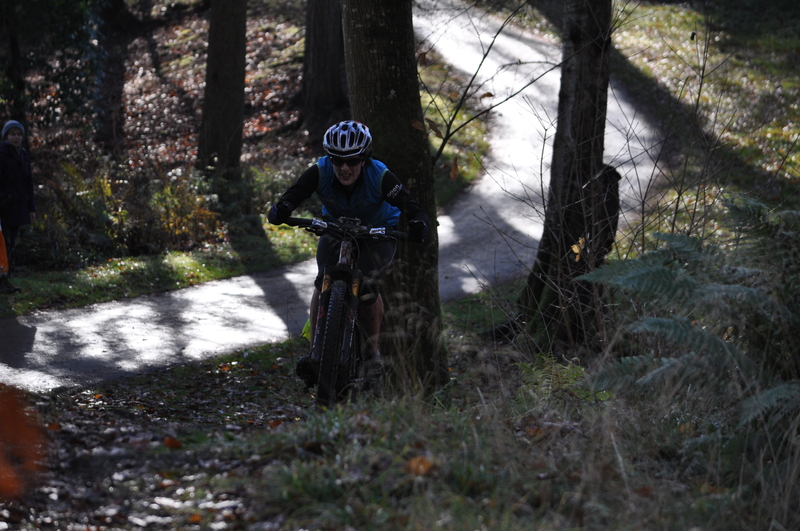 I worked hard on every hill, held my nerve on the singletrack and tried to target the next person in front. 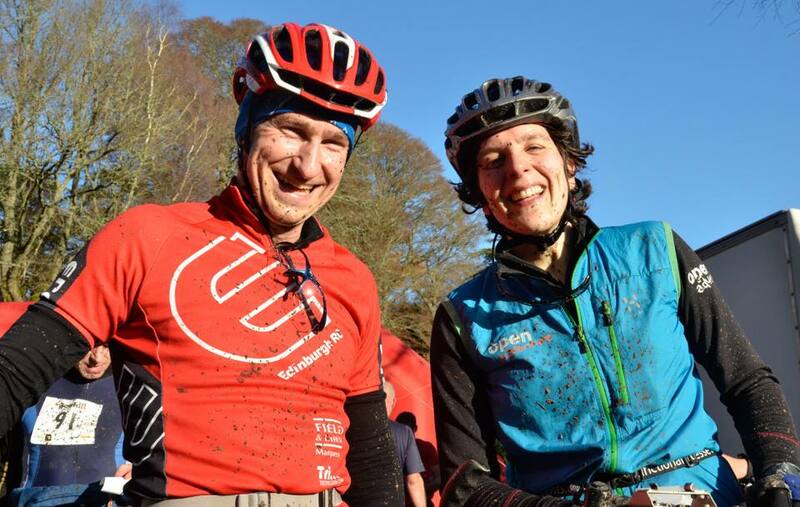 After 7 or 8 minutes I had passed the two girls in front and was pleased to have settled into a podium position. I think I was motivated knowing how many guys I knew were also riding and wondering how many of them I could beat on the bike leg! So I kept on sprinting, reminding myself it was shorter than a spin class so there should be no question of giving into my burning legs. After a while I spied a clump of people up ahead, several of whom were wearing red. The thought crossed my mind that one of them could be Jo, but I wasn’t convinced. As I got closer, I saw my suspicion / hope had been right! I picked my moment and went past, just before we entered the section with the slippery bridge of doom. Andy fell here on his way round, despite the warnings! I took care and had to remind myself not to try too hard as my wheels slipped on some roots. I pushed on, never looking back, and charged up the final sharp little hill. 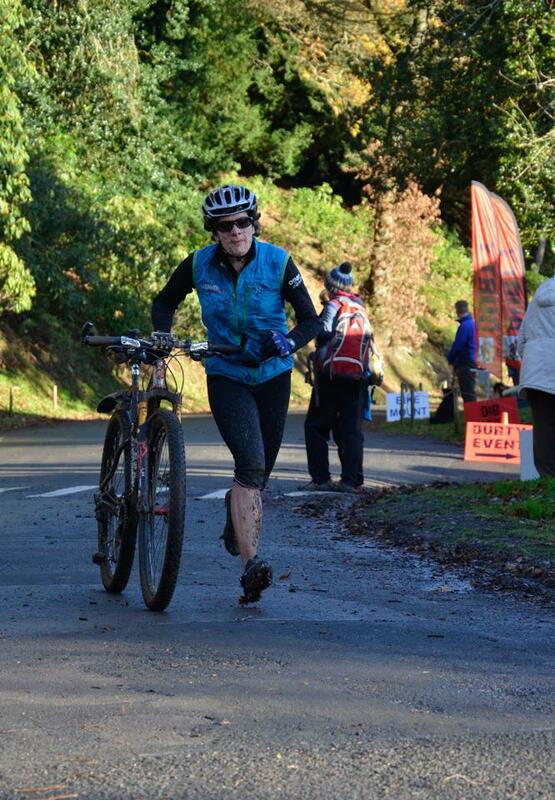 I dared to glance back in case it was coming down to a sprint finish, but I was on my own and elated! 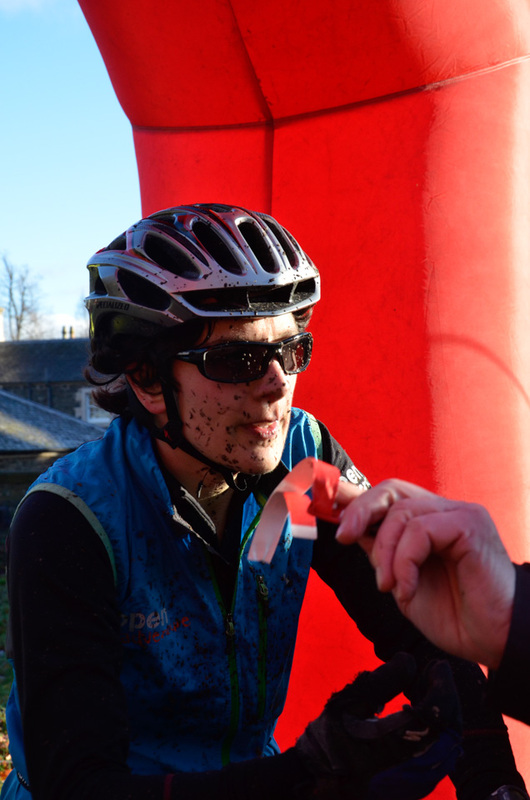 My first win at Bowhill. Jo came in second and did well considering she’d got some bug. Kirsty was 3rd. My times were all faster than last year (by 1m25s, 6s and 40s for run, transition and bike respectively) and I’ve never ridden so hard, though the conditions might have been better. Here are the full results. Picked up some chocolates and beer, did plenty of chatting and it was time to head home. Andy and Glen discussed politics whilst I sat quietly in the back munching Ferrero Rochers. Happy times! Many thanks to Andy Kirkland for the photos, except where credited to Susie Upton. 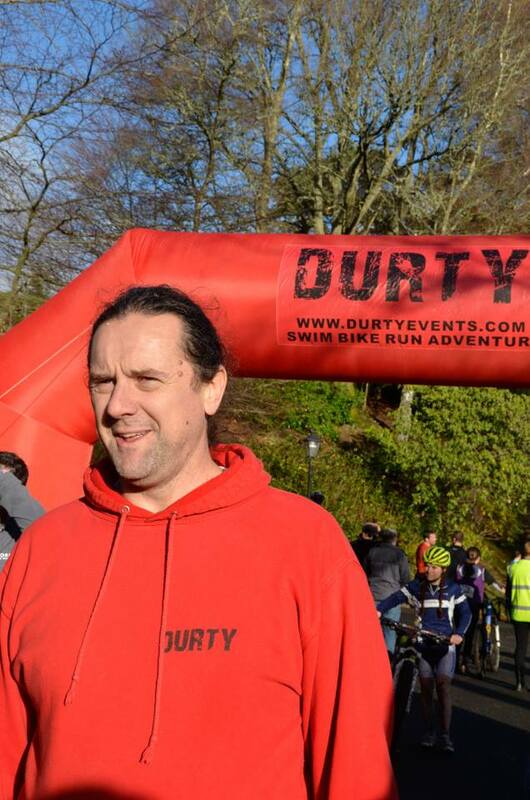 Posted on 06/12/2014, in Adventure Racing, Race Reports and tagged Mountain biking, off-road, race, run, Scotland. Bookmark the permalink. 1 Comment.